You might Zen-out but what about fueling-up with all the goodness your body can drink in? 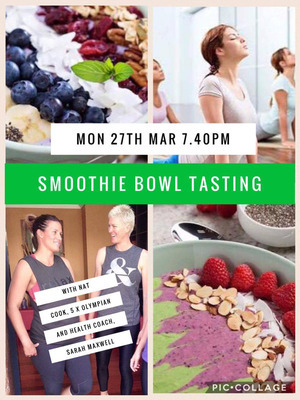 Join us for a smoothie-bowl demo this coming Monday 27th March 2017 at 7:40pm, post evening class in the reception area with 5-time Olympian Natalie Cook & Wellness Coach Sarah Maxwell. Learn how to get all the essential minerals your body has been craving by doing it the simple way!"